An explosion rocked a Seattle neighborhood early Wednesday, injuring nine firefighters, forcing evacuations and heavily damaging buildings, officials said. SEATTLE (AP) — An explosion rocked a Seattle neighborhood early Wednesday, injuring nine firefighters, forcing evacuations and heavily damaging buildings, officials said. The blast occurred in the city's Greenwood section after fire crews responded to reports of a natural gas leak, Seattle Fire Department spokeswoman Corey Orvold said. About 40 minutes after they arrived, an explosion rocked the area, she said. Photos posted on the department's Twitter feed showed firefighters gazing at the rubble of one building, another partial building collapse, windows shattered in surrounding structures, including plate-glass windows of area businesses, and debris tangled in trees and scattered over a large area. Eight fire crew members and battalion chief were rushed to a hospital with minor injuries. Harborview Medical Center spokeswoman Susan Gregg said all of the firefighters were treated for injuries ranging from burns to abrasions and most will probably be soon released. Orvold said an undetermined number of residents of an apartment building and another nearby residential structure were evacuated via buses brought in to help out. There is no word of any other injuries or anyone missing. But Orvold said dogs were being used to go through the rubble just in case. 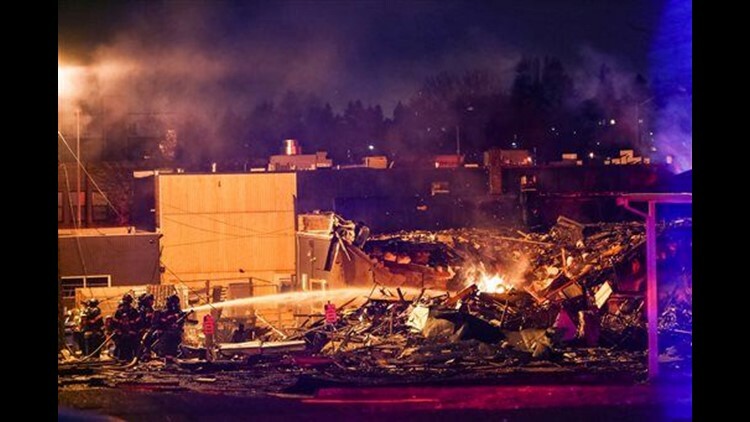 At least one and possibly two buildings were heavily damaged in the 1:45 a.m. PST explosion, while several others in the area have shattered windows and other problems. A man who lives close to the blast site told KOMO-TV that the blast shook him out of bed. "Thought it was an earthquake; way too loud to be a gunshot. So I got out of bed, checked on the family, and my family's good. So I went outside and saw smoke," Josh Coolbaugh said. He said he called business owners in the area he knows to wake them up and tell them what happened. The Fire Department said nearly 70 fire personnel were on the scene at Greenwood Avenue and North 85th Street. They include firefighters, commanders and medics.